This 65-year-old water tower was located on top of the Dole Cannery and was one of the best-known landmarks in downtown Honolulu. 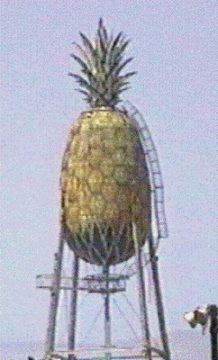 Unfortunately for the local community, the Dole pineapple was taken down and dismantled in October 1993. It had severe rust problems, to the point where large pieces of the tower were falling off and creating a potential hazard. It was 24 feet in diameter and reached a height of 195 feet. Its 100,000 gallon tank was once used to drive the cannery's sprinkler system. Photo Courtesy of Honolulu Community College.